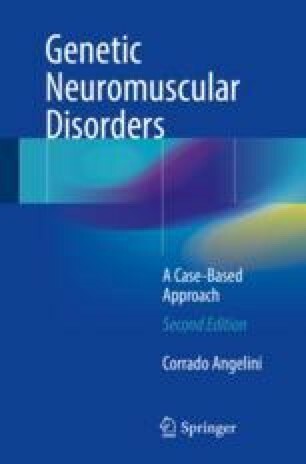 Multiminicore disease (MmD) is a hereditary congenital myopathy characterized by multiple cores on muscle biopsy. Marked clinical variability corresponds to genetic heterogeneity: the most frequent phenotype is characterized by spinal rigidity and early scoliosis, and respiratory impairment is due to recessive mutations in the SEPN1 gene encoding selenoprotein-1, whereas recessive mutations in the skeletal muscle ryanodine receptor (RYR1) gene have been associated with a wider range of clinical features comprising external ophthalmoplegia, distal weakness, and wasting or predominant hip girdle involvement resembling central core disease (CCD). The pathogenetic mechanisms of RYR1-related MmD are currently not well understood but are likely to involve altered excitability and/or changes in calcium homeostasis. The presence of calcium-binding motifs within the selenoprotein also suggests a possible role in calcium handling. Muscle MRI may aid genetic testing as distinct patterns of selective muscle involvement can be detected depending on the genetic background.